UDM Downloads > Decision Assistant Model Excel! The Decision Assistant Model Excel allows you to value a decision and determine the impact on your business. It calculates the range of possible outcomes for your decision, their likelihood of occurring, the average outcome, and the probability of the outcome being positive (profitable). It applies three decision return estimates (Pessimistic, Middle, and Optimistic) and associated decision costs. Outputs cover a 12 month period and are presented in tabular and graphical form. 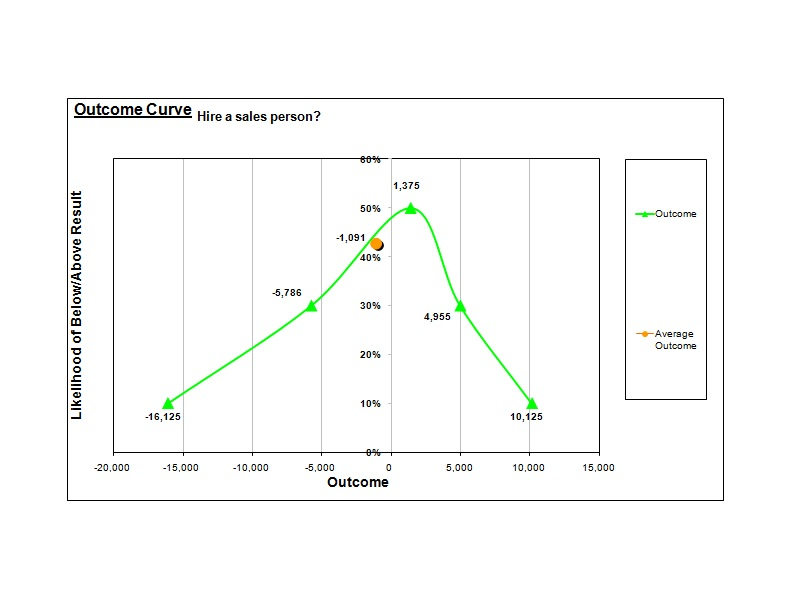 Outputs include a decision Output Curve, Cash Flow Scenarios, a Risk Profile, and an Action Sheet. With the Decision Assistant you can quantify outcomes and identify the best decisions for implementation. It allows you to measure, and monitor decision outcomes. The model is a stand alone decision support tool and can be applied to business planning, budgeting, goal setting, investment analysis, and operational improvement. It is compact and easy to use.